Playing and listening to music formed a large part of the social life of the wealthy Victorian classes. Ladies and gentlemen attended soirees and concerts to demonstrate their musical skills and dance with one another. 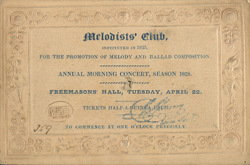 Melodists' clubs such as the one advertised ("for the promotion of melody and ballad composition") were very popular. This particular club was established by the Freemasons of London. Held in the Freemasons Hall in Great Queen Street, it was an all-male event - the Freemasons do not admit women to their ranks.